Alderman Roberto Maldonado, the City of Chicago, The Institute for Workforce Education and W&E Communications, Inc., held a press conference on Wednesday to announce the creation of a new short-term training program that will provide jobs in Broadband telecommunications industry to dozens of Chicago residents. U.S unemployment rate continues to stay in 8.2 percent. Despite the efforts of the government to try to boost the economy, lack of jobs continues to strike thousands of people across the country and particularly in the Chicagoland area. 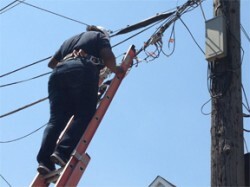 The City of Chicago through the Department of Community development, Institute for workforce education a division Saint Augustine College and W&E Communications, a Comcast broadband contractor in the City of Chicago, have partnered up to create the first Broadband Telecommunications training Program in the country. “We see this as an opportunity to open the door to all of those people who are un-employed. They can achieve a certification as Broadband Technicians, and by doing so, can get a job in a growing telecommunications market” said Ald. Maldonado. Successful completion of the training portion of the program prepares participants to take the National Cable Television Institute’s (NCTI) Qualified Contractor in Core and Video and Qualified contractor in Digital Voice certifications. © 4204 Chicago Hispanic Newspaper, Lawndale News, Hispanic Bilingual Newspapers, Su Noticiero Bilingue. All rights reserved. XHTML / CSS Valid.